MSN.com begins the launch of its new homepage today for its customers in the U.S. Its new homepage is clean and nicely designed with some new features like search, news, local and social networking – all in one place. 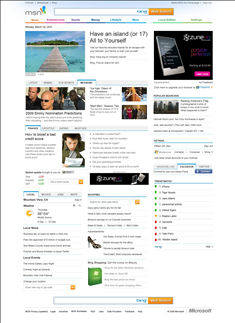 I personally like the new design of MSN homepage. It offers you great new features like integration of your Facebook and twitter accounts with homepage and the ability to check Hotmail and messenger. The Facebook widget gives you the news feed and status updates. You can read in detail about the features offered in new homepage here at MSN blog. Click here to try the new MSN homepage now. Next Article Is The Hosting Company Reliable Or Not! How To Find Out?